To Promote Public Awareness About Children and Adults With Disabilities Through the Sport of Water Skiing and Wakeboarding. RJD Risk Management, Inc. helps companies increase profitability, lower operating and insurance costs through comprehensive risk management and risk mitigation strategies. ​Ann's Angels Waterski Foundation, based in Winter Haven, Florida, To kick off this new fundraising project, I will be donating one night of tips a month, as I am a server. Remember When You Shop At Amazon To Click The Amazon Smiles Link here on this page and select Ann's Angels AWF. 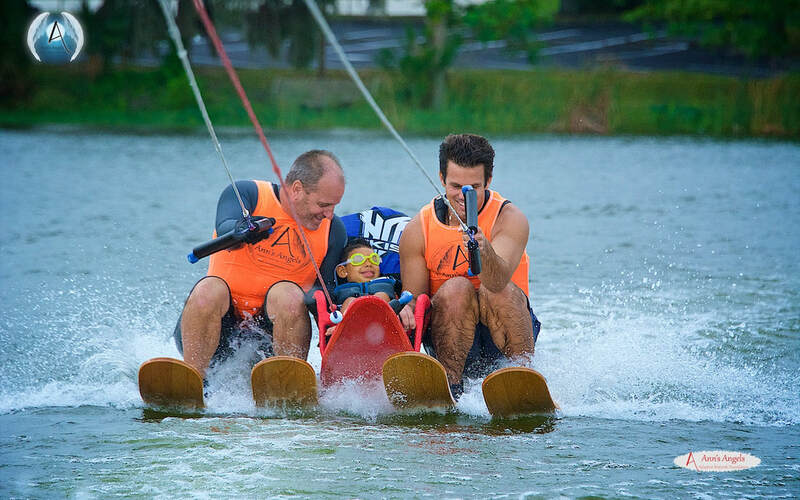 Ann's Angels are based in Winter Haven, Florida and we provide adaptive waterski events and opportunities for children and adults living with disabilities including our military veterans. We find that our programs provide a therapeutic recreation that reduces anxiety and depression while improving well-being and quality of life. We provide all the equipment, safety and personnel to hold safe organized water ski events for organizations, municipalities and individuals that want to provide this recreational sport to their community free of charge to the adaptive participants and their Families. Ann's Angels AWF Inc is a Public Nonprofit and Donations are always tax deductible. ​Volunteer with Ann's Angels AWF and make a difference by giving back to those that need it the most. Email us and become a part of our team. Sign up list will be added to this box at a later date. Get involved and receive email notices of our events and reminders throughout the year. Gain access to our blog and info from Ann's Angels AWF on health and fitness for the adaptive community. ​Host an event with Ann's Angels AWF at our Lake Home site or at your own site. Become part of the solution and host an event that will help show you do care about the adaptive community in your area. Signing to volunteer with Ann's Angels AWF is one of the most rewarding ways to help your community. Click The "Contact Us Here" button above to talk to us about Volunteering or for more details on how to volunteer at one or more of our clinics. You can also fill out our volunteer registration form on the volunteer page by clicking the "Volunteer Sign Up" button above.